Looking back over the past 9 months, we are in awe of how God has given us patience and endurance. We made it through Jordan’s hip and ankle surgery, including 40 days in a cast and 40 days of day rehab. Jordan started a school with a friend for kids with neuromotor diagnosis. He endured 3-shunt related surgeries. And we sold our previous home and oversaw the building of our future home. 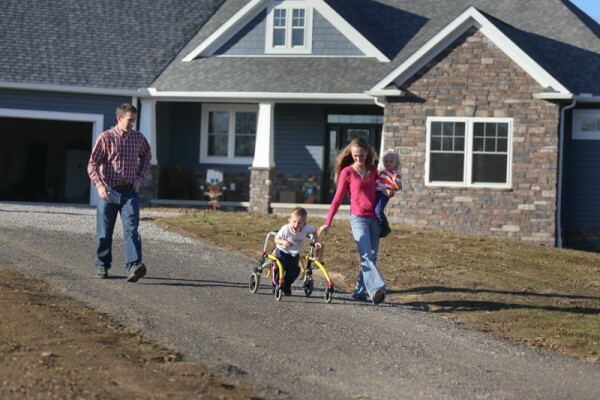 We were excited to invite our builder Mark Zollinger to watch Jordan walk through our home for the first time. 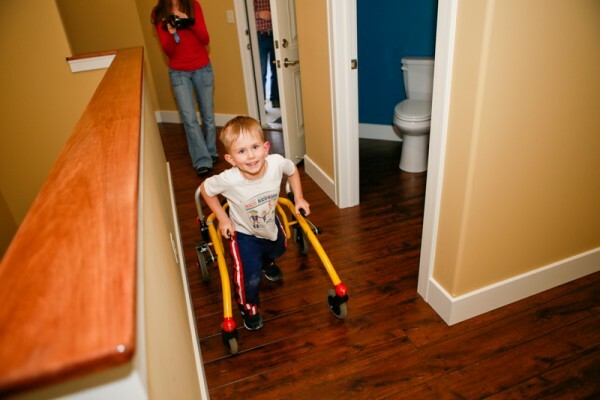 The house he helped us build was now going to prove accessible for our little man to navigate with his walker. We set Jordan’s room and future room up while he was at school as a surprise and incentive to walk through the doors. As his armor (bracing) was strapped, our excitement grew. We placed the ribbon, and with scissors in hand, Jordan took command of his walker and ascended the ramp in the garage. As the ribbon fell we were thrilled to witness a smooth transition into his current bedroom then to a surprise play room which will be his future accessible bedroom and bathroom. The bathroom has recently become Jordan’s garage for his tractors and trucks. To be honest, deep down we were confident that Jordan would be able to walk through the house with his walker. The joy came when he was at his chair in the corner of the room then proceeded to stand up to his walker and navigate over to his barn across the room. Typically he would have gotten down and crawled. What a blessing to witness such an event! As we enjoyed the fall day outside, Jordan decided to walk down the drive and back with his walker. He continues to show us the determination and perseverance he has displayed over and over again. We are thrilled to settle in and make this house a home. We pray that those who come through the doors will be blessed when they come in and blessed when they go out. We feel like we are in a dream and are humbled to have a space to plant our roots and see how God continues to be faithful in our journey. Read more about Megs and Randy’s experiences as parents of 2 children, including Jordan who has spina bifida.